A recent exhibition that has been traveling the world made a stop in Manhattan during the beginning of winter. Famous Japanese artist, Yayoi Kusama, created Instagrammable infinity rooms that took your breath away. Yayoi Kusama is one of the most brilliant artists of our time. She is a Japanese artist who moved to New York City in 1957 to pursue art and abstract expressionism. Kusama produced a series of paintings before eventually turning to her preferred medium of sculpture and installation. Her childhood involved her connection with plants and farms. When she was around 10 years old, Kusama began experiencing hallucinations. The hallucinations included "flashes of light, auras or dense fields of dots." 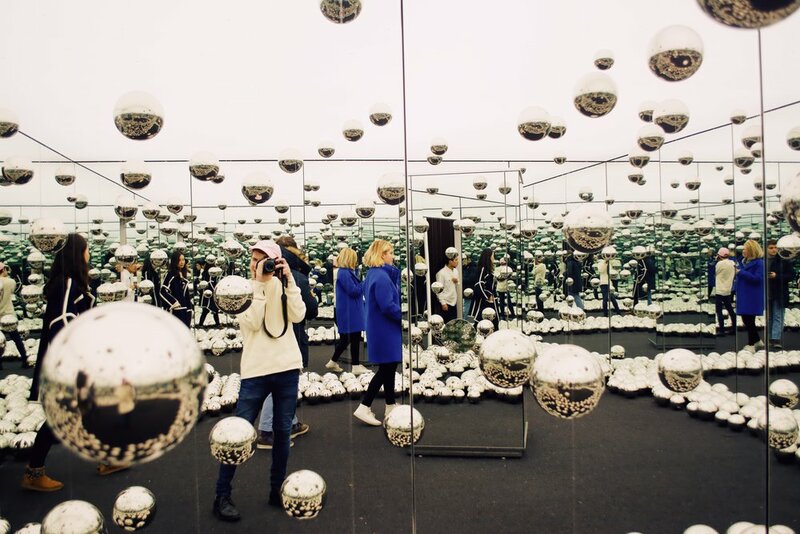 One of the most popular series of works created by Kusama is best known as the "Infinity Mirror Rooms." The giant installations were presented by David Zwirner at 525 and 333 West 19th Street in Chelsea and the Infinity Nets at 34 East 69th Street on the Upper East Side. I had the opportunity to experience the exhibition in Chelsea on the last viewing date for New York City. Following a busy morning, I got to the line at the David Zwirner Gallery and couldn’t believe my eyes. THE. LINE. WAS. HUGE. I followed the standby line all the way down the street, around the corner, and almost to the end of the next street over. Hailing from New Hampshire, I was familiar with the cold and 40-degree weather was a piece of cake for me. The only issue is when you put that together with wind and time, you start to run into problems. After a five hour wait, later accompanied by my friend Juliet and her boyfriend Chris, I made it to the infinity mirror rooms. The "Longing for Eternity" room comprised of mirrors on the walls, reflective tile on the floor, and lighting fixtures hanging from above. Viewers could look through the peepholes and experience the changing lights. Since the mirrors made up the walls of the room they gave off the illusion that there was an infinite universe expanding beyond the room. Another part of Kusama's exhibition included a room ("Let’s Survive Forever") with white mirrors and reflective stainless steel balls. In the center of the room was a smaller cube with peepholes to look inside. On the inside, you could see smaller steel balls going on for infinity. The final Instagram-worthy installation titled, "With All My Love For The Tulips, I Pray Forever" contained three giant (fake) tulips that were all white and covered with red polka dots. Once we made our way to the end of the gallery, we came across a different medium of artwork by Kusama. The space was filled with giant paintings that lined the entire room. And in person, these paintings were massive and extraordinarily detailed-oriented. This room showcased 66 paintings from Kusama's highly praised "My Eternal Soul" series. In the center of the room were more (fake) plants, though these plants looked much more ceramic and glossy compared to the tulips. They resembled plants you would find in a Mario game, which is interesting because Shigeru Miyamoto, the creator of Mario, is also from Japan.